I bought the windows for the playhouse today. I finally uploaded some photos to Flickr. They are a bit underwhelming so far. I haven't been able to start on the 3 walls that contain windows because I didn't know where I could buy them. I can finally move on with my plans. I decided to make the girls a playhouse that would take up 8ft x 8ft in the back yard. 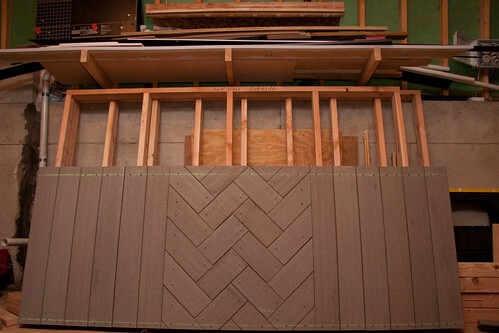 Most of the plans I found online were for a 8ft x 4ft, only 4ft tall (excluding the pitched roof) with a 2ft porch. I really appreciate the insight I got from those plans but I think 4ft on the inside is just too small, my 3 yr old is 41 inches tall already, and 2ft for a porch doesn't even give you room for a chair. So, I decided to make it 5ft x 8ft and 5ft tall with a 3ft porch. I realize that at some point we won't want this thing in the backyard anymore and an 8x8 structure can't be moved without a CDL (trucker's license). For this reason I have decided to make the covered front porch detachable. I accomplish this with separate foundations for the house and porch and a 2 piece over-under roof system. Here are the plans. So far I have framed both floors and the back wall. Today I bought and cut the composite decking for the porch and picked out the 4 windows. Now that I have settled on 18in x 27in windows, I can make the front and side walls.